Time for another installment of my Back to Basics series! I know it’s been too long since our last Back to Basics post on Roasting Potatoes, but Heather and I have been very busy lately with some big plans coming to fruition soon! There will be lots of exciting things coming in the near future! Anyways, today I’m going over the basics behind some delicious Asian sauces that I’ve learned to make. Many of our favorite Asian inspired dishes boil down to one thing: the sauce. There are so many amazingly delicious and complex ingredients and flavors in Asian cuisine so it’s no surprise that they developed a myriad of great sauces. Over the years, I have attempted to recreate some of my favorites from scratch and as a result have come up with some pretty good recipes to share. Read on, then try your own hand at it and enjoy! This Sesame Stir-Fry sauce is amazing! The recipes for these Asian sauces came about in the same way that most of my best recipes have. They probably all start with Heather coming up with an idea or asking me to recreate a dish and, in the spirit of Chefing Around, I take that idea and run with it. This process is then repeated numerous times with slight variations until the perfect recipes emerge. So I guess you could say these recipes evolved, mimicking the mechanisms of randomization and selection that drive biological evolution. But that’s probably how most great recipes come to be. The process is fairly similar for all of these sauces and some of the ingredients can be used to make several different varieties so you won’t have to buy a whole new set of ingredients for each one. The process begins with heating some oil in your saucepan. Then you add garlic and saute until fragrant. Finally, you add your liquids and spices, such as soy sauce, rice wine vinegar, and ginger and bring it to a simmer. Once your sauce starts to boil, you can add corn starch, if you want. We like to add some to thicken ours. If you do, you should stir the corn starch into a little bit of cold water and then add that to your sauce while it’s boiling. This keeps it from clumping up in your sauce and will give you the smoothest results. So, add your corn starch/cold water mixture and bring back to a boil until sauce thickens. And that’s it. The only differences will be the ingredients you add to highlight certain flavors. Speaking of ingredients…there are pretty much infinite possibilities in order to cover all kinds of Asian sauces. Soy sauce, fish sauce, chili paste, rice wine vinegar, ginger, garlic, and sesame oil to name a few. Various combinations and ratios of those ingredients will create endless delicious sauces to satisfy all of your cravings. If you want something spicy, use more ginger and chili paste. If you want something savory, maybe more sesame oil and garlic. Looking for something sweet and sour? Add some brown sugar or honey and fish sauce/rice wine vinegar or citrus juice. Want to make an orange sauce? Add orange juice and zest. An example of some of the ingredients I use. So, that’s it. The possibilities are endless and you may want to figure out what ratios taste best to you. Feel free to Chef Around and make these your own! 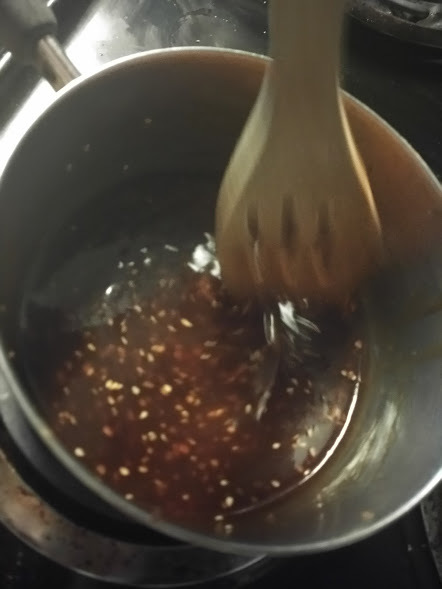 A sweet and savory toasted sesame sauce for stir-fry or other Asian dishes. Add garlic and saute until fragrant, about 1-2 minutes. Add rice wine vinegar, soy sauce, honey, sesame oil and ginger and stir until thoroughly combined. Mix corn starch into cold water and add to sauce when it comes to a boil. Continue to boil, stirring frequently, until sauce thickens.